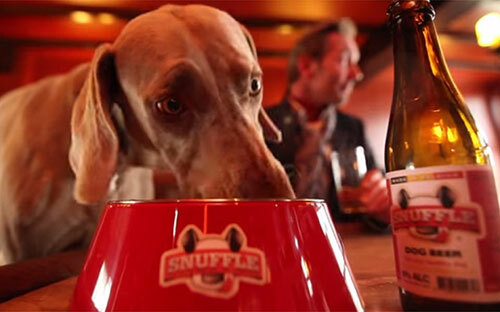 Snuffle is believed to be the world’s first beer for dogs. But before you start considering going on a bender with your dog, bear in mind that this Belgian beer is alcohol free and supposedly healthy for your canine friend. That’s right. Snuffle dog beer even contains vitamins and minerals for your dog’s good health. Plus it isn’t carbonated like regular human beer – because most dogs are gassy enough already. Dielens told The Telegraph in the United Kingdom: “Belgium is famous for its beer, so for us the goal is to also have the very best beer for dogs – it must be from Belgium. The idea for Snuffle dog beer came about after a hunting exercise in the Swiss Alps. Unsurprisingly, its inventor was enjoying a cold beer at the time, when he wished the he could enjoy a beer with his best friend – his faithful Weimaraner. Four years later and Snuffle beer was born. Snuffle has just been introduced to pet stores in the UK. Like with human beer, the company promotes responsible drinking. It’s recommended that small dogs consume no more than half a bottle in a day, medium-sized dogs have one bottle, and large dogs can knock back two in a day and still be able to drive home afterwards (only joking).